Looking at a Woodrow Blagg graphite drawing is like being transported to another time and place. They remind one of a scene from a big screen Western. In fact, movies like Hud and High Noon, Blagg says in an Aspen Times 2010 article, inspired him. Blagg’s western art is not a freeze frame of a spaghetti Western. Neither do Blagg’s drawings seem to stand still—dust rises, ropes loop in the air, cattle crowd together. Blagg is able to capture and suspend the heart of a moment within the cowboy culture and still convey the motion. He does this with without Hollywood sensationalism and Paul Newman. He does it with strokes of graphite inspiration, recreating authentic moments in western life. This western way of life was not something that he viewed from the outside in. 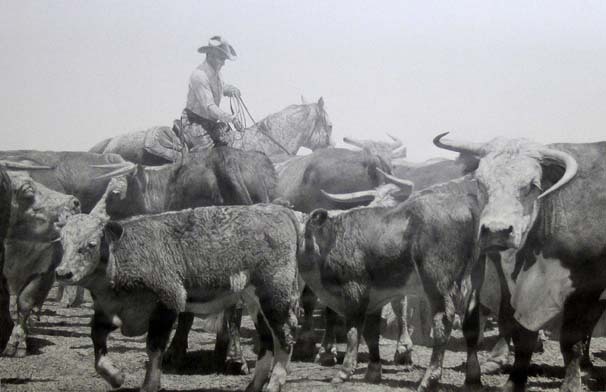 A native Pennsylvanian, Blagg immersed himself in the Texas cowboy culture—round-ups, herding cattle—not as an observer, but as a participant. He translated this first-hand experience through skilled graphite strokes of inspiration in honor of his subjects: the cowboys.